Turning down 23rd Avenue towards International Boulevard, I see the words “Culture is a weapon” painted the side of a building wall. Painted below are indigenous peoples, Black Panther party members and immigrant workers. This everted museum among concrete and discarded trash sits behind a wired gate. I am peeking into the Congolese culture of national symbols, weavings and dancers in their traditional dress. 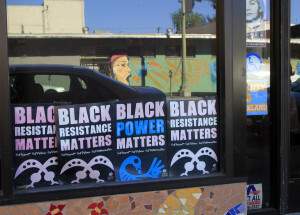 Turning left I see political posters, with black fists and brown faces lining the glass windows. It’s as if the Black and Chicano Art Movement is leading me like breadcrumbs to the front door of Eastside Arts Alliance. Inside is a beautifully curated museum featuring black-and-white photos of Malcolm X, Eldridge and Kathleen Cleaver, Stokely Carmichael and others. There is a small stage and white piano. Moving along, I realize my footsteps have been keeping rhythm with music – young people rapping in the back room. Favianna Rodriguez puts it best. Rodriguez is one of the co-founding artists that helped create the center. Creating this type of space is essential for what Rodriguez explains as a type of pipeline. She says she was fortunate to have mentors in her youth teaching her things that she would then pass along. I can see many of those artists at work here today. Paintbrushes and spray cans are scattered on the work table, and parts of finished paintings hang on the wall to dry. A small child and a large brown dog race past me headed for the open door. 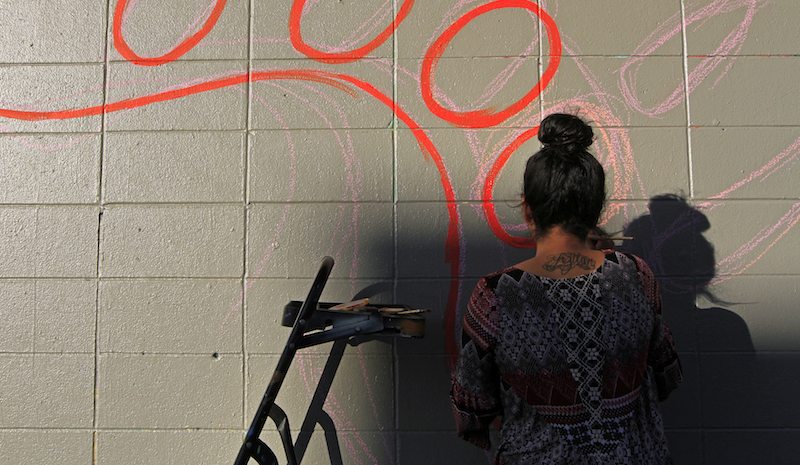 Outside is a classroom with no chalkboards or desks – just walls filled with graffiti. I begin talking with one of the program’s students, Gabriel Lopez, about how he came to be here. As Lopez talks, I see one of his peers outlining the tip of an arrow in gold, while others work on a native warrior. They’re part of a mural that will eventually be displayed on International Blvd. and Fruitvale Ave. Lopez tells me about another piece he did recently, on the side of a store on 64th Ave. and International Blvd. Lopez tells me that even though it looked “cartoony,” the mural’s message was important. Because graffiti is public art, there is always a chance that it can be written over, or “buffed.” This piece was no different. But Lopez says the chance to create was still worth it. “Public art has its roots in liberation,” he says. One of the program’s core staffers is Jose Gabriel, known as Peps, who began as a student and now teaches the about importance of public art, as well as its beginnings. Peps adds that there are plenty of places where you can draw pretty things, but here in the Visual Arts program, there’s a different focus. “If people want to learn about history, struggle, politics and how all those things intersect with art and how to use that to move these issues forward, then this is the space for that,” he says. Those who do stay, thrive. People like Allison Santiago, Peps’ niece. At 21, she’s the program coordinator of the Visual Elements program — she’s been here since she was 15. Though she’s one of the younger staffers, it’s clear she has a true passion for her work. 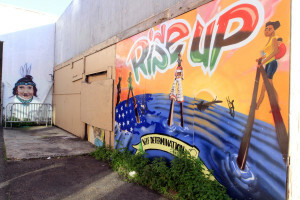 As she sets up a section of the mural of the native warrior for the next student to outline, she explains why Visual Elements is essential when creating art in a city that’s constantly changing due to gentrification and displacement. Taking on the knowledge given by her mentors and sharing it with others, Santiago is now a teacher in her own right, keeping the traditions and the pipeline strong. Like Lopez, Jose Jimenez is a student of Santiago’s but is new to the program. He says he has been experimenting with graffiti since the age of nine. He’s now 19, but admits he is still learning. “There’s always something, even though I’ve said I’ve done it all my life, you always have something to learn from somebody else,” he says. Although he is self-taught, Jimenez comes to the program for his own reasons. “I’m in that process of trying to work towards a better future,” he says. And here at Visual Elements working on a better future looks like community. Like murals of native warriors and black and brown cultures. 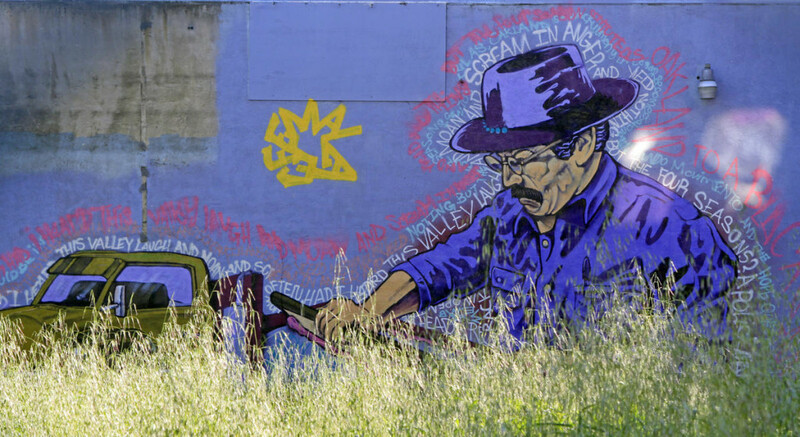 It looks like opening up a conversation about food justice through art and teaching the history of Mexican street art through conversations with street artists from Mexico. And like learning better can techniques on a Wednesday night. 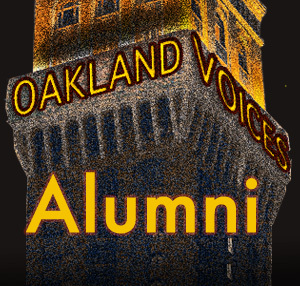 If you want more about the arts in East Oakland, check out Sights and Sounds of East Oakland this Sunday afternoon at 3pm at the Laney College Theater. It’s a celebration of the arts in East Oakland, featuring dance, music, poetry, storytelling, cookies and it’s free! 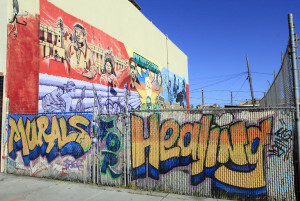 This story is part of KALW’s Sights & Sounds arts project and was produced in collaboration with Oakland Voices, a community journalism training program run in partnership with the Oakland Tribune and Maynard Institute for Journalism Education. 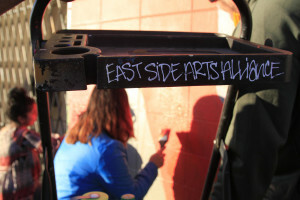 Thanks to the California Arts Council and the California Endowment.